Where Does Your Dental Practice Rank? Type your city/state and see where your Dental Practice ranks for the terms your customers use to find the services you offer. See if your business listing shows up on Google, Yahoo!, Bing, Merchant Circle, Yelp, SuperPages and Local.com. Very Cool! 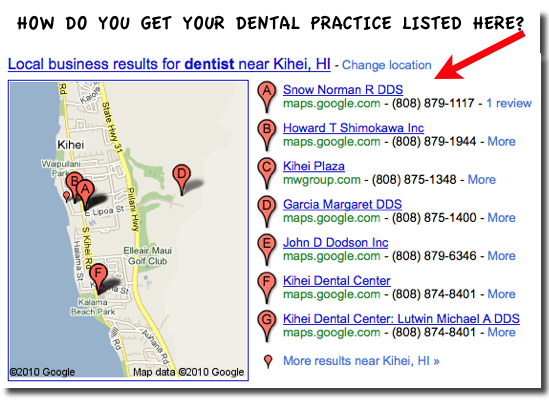 If your Dental practice is not showing up on the map for the most commonly used terms people are using to find a dentist in your community, you can do one of two things. It took us a long time and a lot of experience to learn how to do local search marketing right and avoid the potentially damaging potholes. Because of that, we tried to add as much information as possible to our site to help you get started in the right direction. I encourage you to start on our DIY page.